Some conservatories can be like an oven in summer and a fridge in winter. But, with the right blinds, you can control these extremes of temperature – and enjoy your conservatory whenever you want. 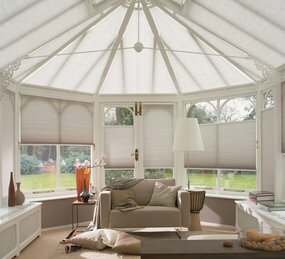 Find out more about how Luxaflex® Duette® Shades can help you make your conservatory a comfortable place to enjoy all year round. Duette® Shades, invented by Hunter Douglas, give you the best of both worlds; helping you keep out the heat in summer and keep it in during the colder winter months. In fact, they so effective at retaining warmth, you may not have to switch your heating on as much – and you could reduce your heating bills. 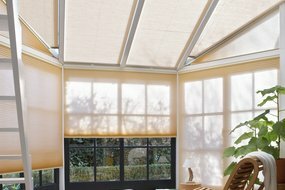 All Duette® Shades have a unique honeycomb structure which is specially designed to trap air inside and provide excellent insulation when you need it most. Duette® fabrics can also be treated with an exclusive coating which reflect as much as 78% of heat back out of your home – helping you keep cooler in summer. Fabrics specially coated with Luxaflex® Dustblock® are anti-static and actively repel moisture and dirt. This makes them especially easy to clean and keep in pristine condition – looking stylish and vibrant for years to come. Conservatory blinds don’t have be conservative when it comes to style. 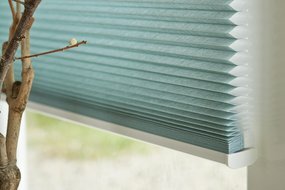 Our Duette® Shades are available in a rich and tactile textured weaves and a complete range of transparencies – so you can find your own perfect balance of light, privacy and stunning design. Every conservatory and window is professionally measured and expertly made to measure, so even the most unusual shapes, slopes and individual sizes can be successfully tackled. Your local Luxaflex® showroom will give you all the help you need. No matter how large your conservatory, you will be able to open and close your Duette® Shades with a simple remote control or wall switch. Or, you can choose a child-safe hand operated system…it’s up to you – but either way, you’ll be able to enjoy a simple way to adjust light and privacy. Your local Luxaflex® showroom will be happy to help you find which option suits you best.